This wedding, which took place last month, was the SWEETEST. Abbey and Jake describe their love story as a "fairy tale," and their wedding was truly a fairy tale wedding. They chose a woodland theme, and every detail was classic, timeless and romantic. Many of their details were incredibly simple, and this wedding is proof that less really is more. It couldn't have been prettier! Stephanie Dunn King Photography took these magical photos, and we have alllll the heart eyes right now. Abbey and Jake were married at The Barn at Twin Oaks Ranch on June 1, 2018. They chose a beautiful, romantic theme and a simply lovely color palette. "Everything about our love so far has felt like a fairy tale, so we really wanted a bit of a romantic, fairy tale theme," Abbey said. "We also wanted something that looked timeless and classic, so we chose a woodland fairy tale type theme. Our colors were simple: shades of white, greenery, with hints of gold accents." Abbey's florals were classic and elegant. She chose white roses and ferns to be used throughout her bouquets, altar arrangements and other florals. They were so simple, yet stunning. "We loved all the little details, especially the greenery and flowers," Abbey said. A fairy tale wedding needs a dress fit for a princess, and Abbey found the perfect one at JJ's House. It had a classic scoop neckline, the sweetest floral lace details, buttons down the back (so pretty! ), and a gorgeous train. She also wore a floral hairpiece that was the perfect modern touch. Abbey, you're the epitome of a classy, timeless bride! 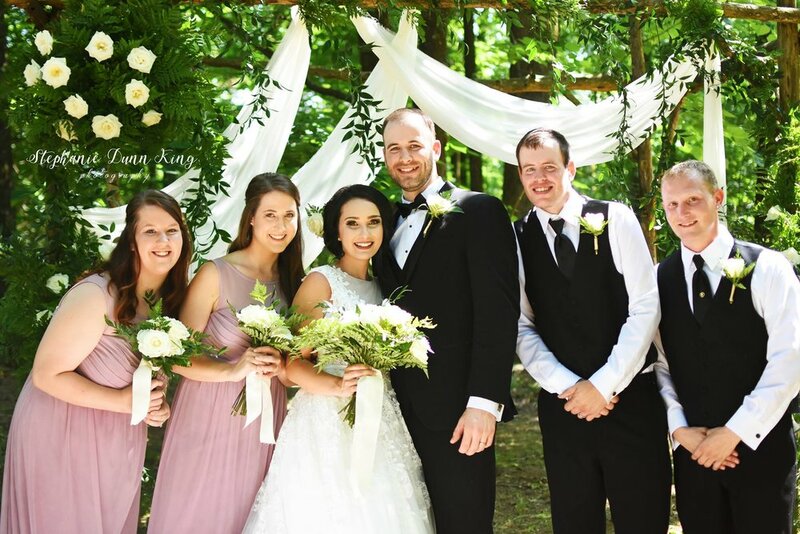 The bridesmaids looked beautiful in elegant light pink dresses from David's Bridal, and the guys looked so very handsome in classic black tuxes from Formal Affairs. This bridal party will never go out of style! Abbey said one moment she would never forget from her wedding day was the sweet first look she shared with Jake before their ceremony. "I loved getting to have a first look before the wedding!" she said. "It was so special to get those few moments together before we officially became husband and wife. I’ll also always remember how excited I was! I was literally jumping up and down at the altar because I was so happy." Jake said his most unforgettable moment was, “Everything. I don’t think there’s one thing I’ll forget.” We love this groom! The land out here at The Barn is lush and green during early June, so Abbey and Jake's woodland fairy tale theme and simple color palette fit flawlessly with their wedding's surroundings. These photos of them are so lovely and romantic, and they show just how much these two adore each other. Plus, The Barn just looks SO good in these! Early summer out here is pure magic. We're obsessed with this amazing couple and these incredible photos of them! Abbey and Jake's ceremony felt just like a woodland fairy tale. Our outdoor ceremony site was full of green on this day, so their white roses and ferns fit right in to the setting. Have you ever seen a more perfect ceremony?! The Barn was really showing off on this day! Their altar was one of our favorites... a unique white drape with loads of ferns, greenery, and white roses. The aisle was lined with mason jars full of simple floral arrangements. They had the cutest little guest table and a picture puzzle inside a frame Jake made. One of the sweetest details was a photo display on a tree that showed precious photos of the two of them throughout their relationship! Abbey and Jake put a lot of effort into personalizing their ceremony, which made it extra special and sweet. "Jake made a box for our rings the day before the wedding," Abbey said. "The music before the wedding was instrumental versions of some of our favorite Disney songs, along with the Harry Potter theme song and the Jurassic Park theme song. My dad got ordained just so he got officiate our wedding, and my mom walked me down the aisle, which was really special to me!" A bride and her mama... basically the sweetest photo we've ever seen! Abbey and Jake's reception was elegant and classic. Their reception tables were understated and simple, with gold tablecloths and white runners, various gold vases and lanterns, and ferns. It all looked magical under our sparkling chandeliers and draping throughout The Barn! Their cake table included a ruffly white tablecloth (we love these! ), a classic cake stand, custom champagne flutes, and a simple white cake topped with, of course, ferns and white roses! Classic, elegant, and soooo pretty! Abbey made the cutest favors to send home with their guests! "We got honey sticks and tied two together with thin twine, then attached a tag that said 'Love as sweet as honey' with the wedding date and our names," she said. Abbey and Jake had the most romantic grand exit. "I loved the rose petal send off, having all our loved ones cascade us with petals as we walked out of the reception," Abbey said. Then they went on probably the most fun honeymoon ever... "We went on an 'old school,' unplanned road trip out west using only maps and road signs (no Google Maps lol)!" Abbey said. "We saw the Grand Canyon, Four Corners, Hoover Dam, Las Vegas, Mount Zion, etc. We left the day after the wedding and came back 8 days later. It was a blast!"